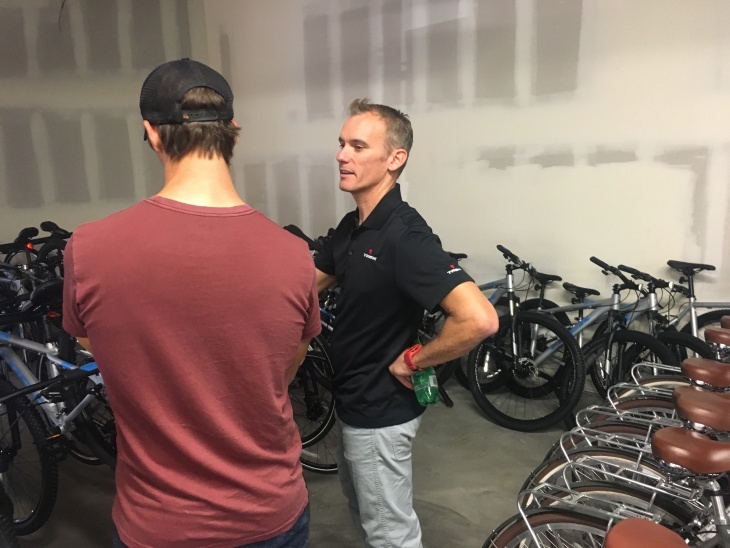 The week of the Woolsey Fire brought a double tragedy to the Trek bike store in Westlake Village. Blake Dingman, the brother of one of the bike shop's employees, was killed in the shooting at the Borderline Bar & Grill in Thousand Oaks the evening of Nov. 7. 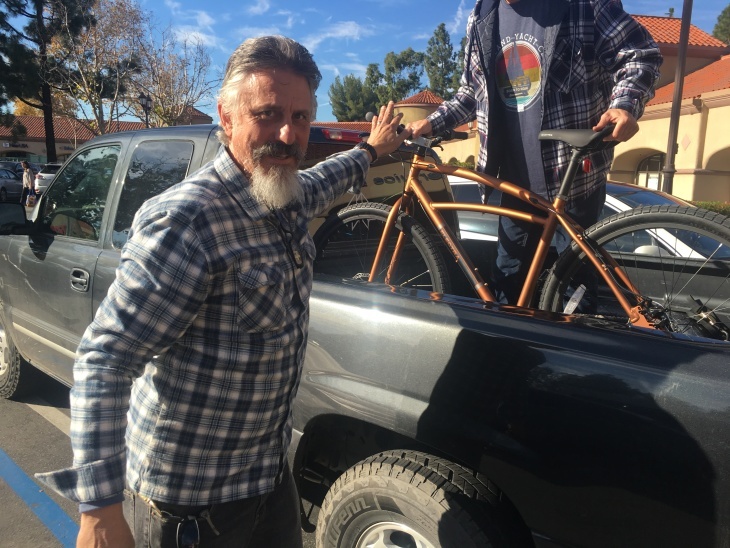 As the bike store workers were coping with the emotional fallout, the next day the Woolsey Fire broke out, threatening many of their homes. Much of the shop's customer base, which extends to Malibu, Las Virgenes, Calabasas, Agoura Hills, and Thousand Oaks was ordered to evacuate the area. Fire came within one street of the bike store, and it was closed for several days. When it reopened, manager Danny Lupold felt compelled to do something to help his community, where 1,500 families were suddenly homeless due to the fire. So he asked the store's owner, Trek Bicycle Corporation in Wisconsin, and Electra Bicycle Company, which is owned by Trek, to donate some bicycles. They came through. The companies sent 200, arriving on big pallets, in boxes — all needing assembly. Lupold's excitement quickly turned to anxiety. "Oh gosh, we've got to get these built, and built quick, because I want to get stuff done before Christmas," he said in an interview at the store. His landlord gave him free space for an instant workshop. But his own small staff of employees wasn't enough to assemble all the bikes. So he and others put out the call for volunteers on Facebook. The request went viral in the online cycling community and people began showing up to help. They included a crew of Ventura County firefighters, who left in the middle of their repair shift to respond to an emergency call — then returned. Chris Craig, an avid mountain biker, also volunteered. His own house was damaged in the Lynn Fire, which burned near Thousand Oaks at the same time the Woolsey Fire was tearing through the mountains toward the ocean. Another volunteer, Robert Frank — a retired Air Force vet — drove from Redondo Beach to help out for the afternoon Wednesday after hearing about it from his girlfriend. "This is the third one I put together. I haven't been here very long," he said. The pop-up workshop, initially filled with 14 pallets of unassembled bikes, became jam-packed with fully and partially assembled Trek and Electra bikes — tiny kids bikes, beach cruisers, mountain bikes, hybrids, Dutch-style commuters. Lupold helps the families pick out bikes. However, some find it hard to accept the gift. "It's this emotional roller coaster even just to come in here for 30, 40 minutes to go through this," Lupold said. Johnny Fortiere was there Wednesday to load bikes for himself, his wife, and two kids aged 7 and 9 into a friend's pickup truck. His home was one of 100 mobile homes that burned in the Seminole Springs neighborhood — the family is in a temporary rental for now. He became emotional talking about the donated bikes. "I'm overwhelmed. I'm extremely grateful," he said. 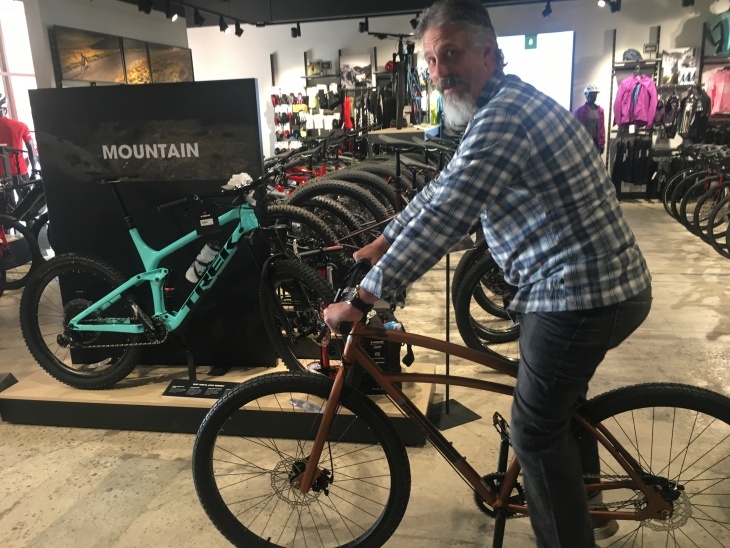 Fortiere picked out a copper-colored cruiser bike. The color, he said, reminded him of root beer. He and his wife went out for root beer floats on their first-ever date. "When it's my turn to do something [similar] for somebody else, you know, will be my turn to pass this on," he said. He rode the bike right out of the store into the afternoon sunshine, cheering as the automatic glass doors opened for him. "There is no normalcy in their lives other than eating our meals, staying together and getting along," Fortiere said of his family. "We're just simply trying to go forward." The gift of these four bikes will give their lives a bit of normalcy — just in time for Christmas.